“I’m very confident that we’re going to have criminal charges on one or more police officers” from a raid that left two suspects dead, Houston Police Chief Art Acevedo said. 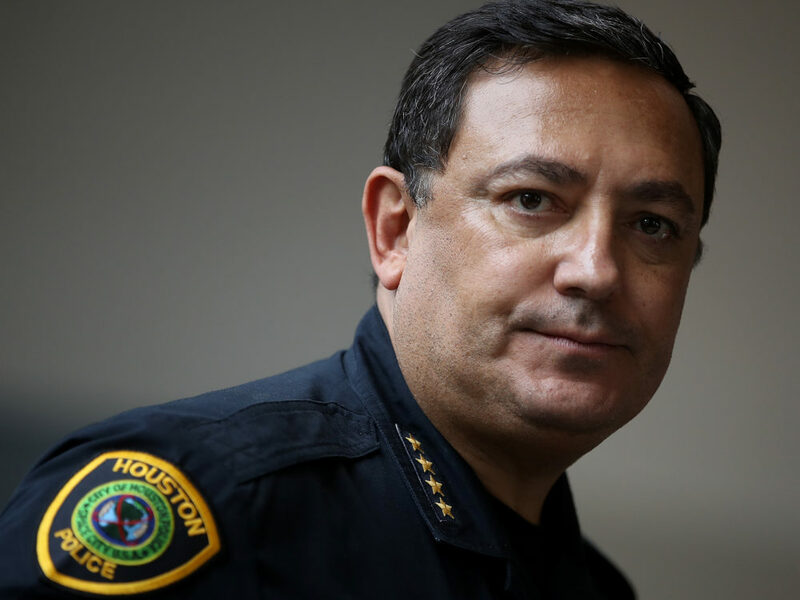 Houston Police Chief Art Acevedo said criminal charges will be filed “against whoever is appropriate” on his department, following a drug bust that resulted in the deaths of two suspects. Houston Police Chief Art Acevedo says his department will stop serving “no knock” search warrants, weeks after a raid on a house left two married suspects dead and five officers injured. Acevedo also reiterated that the officer who led that raid may face criminal charges. “The no-knock warrant’s going to go away, kind of like leaded gasoline in our city,” Acevedo said. He added that raids that stem from those warrants would only be used in very limited cases — and that they would not used to nab people suspected of dealing small amounts of drugs. “You’re going to see those going away,” he said. Acevedo announced the policy shift Monday night during a town hall meeting hosted by the Greater Houston Coalition for Justice. The event gathered criminal justice officials and politicians with local activists and members of the public — who vented their anger over the deadly raid and what they called the police’s overreliance on informants and searches rather than investigation. The chief gave few new details about suspicions the lead officer in the raid may have lied about getting a tip about the target house from a confidential informant. Acevedo said the officer is still getting paid as the investigation proceeds, saying the arrangement is required legally but goes against his own opinion. “I’m very confident that we’re going to have criminal charges on one or more police officers,” Acevedo said Monday. Dennis Tuttle, 59, and Rhogena Nicholas, 58, died in the Jan. 28 raid, which had been planned after an informant purportedly told police the couple’s house was used for heroin dealing. No heroin was found at the residence, and Acevedo and the Houston police were forced to backtrack after initially saying the two suspects had opened fire on officers as soon as they reached the door of the house in the Pecan Park neighborhood, south of downtown Houston. The official narrative changed after it emerged that the police seemed to have opened fire first — shooting the couple’s dog. “The shootout occurred when a group of officers were serving a ‘no-knock’ search warrant to seize heroin at 7815 Harding Street. According to a timeline, a pitbull dog attacked them upon entering the house and an officer shot and killed the dog. Subsequently, a male suspect came from the back of the house and opened fire. An officer was hit on one of his shoulders and fell on a sofa in the living room. As The Houston Chronicle has reported, police found relatively small amounts of marijuana and cocaine at the house, which also contained several guns. With the legality of the operation now in doubt, Acevedo said his department is required to review other cases that involved the same officers who carried out the raid. “There is no excuse,” he said. The conversation at Monday night’s town hall grew testy at times, with members of the crowd sometimes shouting accusations against the chief and his department. But that changed after Houston police uncovered what it believes to be criminal misconduct by one or more of its own officers, the chief added. The Chronicle and other media outlets have identified him as Officer Gerald Goines, a 30-year police veteran. The attorney for Goines, who was shot in the neck and face, said on Tuesday that the officer is innocent; as local TV news KPRC reports, she also said the case is at risk of being distorted by public and political pressures. The FBI is already involved in the case, he said, adding, “We’re uncovering our crimes and we’re not worried” about missing anything in the inquiry. Acknowledging the anger and skepticism in the room, the chief said, “I promise you all, if you’ll have the patience, you are going to see good come out at the end” of the police investigation into the case and a review of its policies. The deadly raid was not captured by body cameras; in the coming weeks, Acevedo said, his officers will begin the practice of wearing them during warrant-based entries to houses and other buildings.